It’s two full days later and the US is still buzzing over Kamal Bey‘s mesmerizing run to gold at the Junior World Championships. With the win, Bey (74 kg, Sunkist) accomplished two important feats. The first, and most obvious, is that he snapped the 18-year streak of the US coming home from the Junior Worlds without a champion. That had been talked about enough leading in and even more so by Saturday afternoon. But just as importantly, the 19-year-old also offered proof that the country’s recent focus on ingratiating more youth into the program is working. Bey was a super-talented age group wrestler from Illinois before he ever came to the Olympic Training Center. He arrived as a bright prospect with raw gifts and a goofy personality. The goofy personality is still there, but those gifts are no longer raw. Instead, they are becoming increasingly refined to the point where prior to this past weekend, everyone and their mother knew he had a shot to win the whole thing. Bey and pal G’Angelo Hancock (96 kg, Sunkist) have been the flag carriers for USA Greco’s vaunted youth crew and both have played an instrumental role in showing what can happen when talented high school-aged athletes who clearly demonstrate unique abilities are put in an elite training environment. Would Bey have still become a World Champion if he was part-timing it somewhere else? No one knows. But the confidence he displayed executing his exciting brand of Greco throughout the day very likely would not have been cultivated quite the same way. 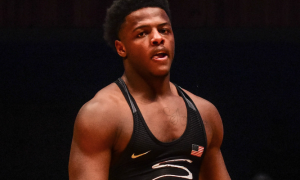 Instead of continuing on in scholastic wrestling and maybe finding his way to a decent collegiate program, Bey was traveling overseas and gaining valuable experience most American wrestlers usually don’t acquire until they are in their 20’s, at best. So there’s something to this and it has a few moving parts. Bey has now become the poster child for US age-groupers going Greco earlier. At least for the time being, it’s his name that will be brought up in an “See how this works?” kind of way. It also helps that Bey has been successful as a Senior. That matters here, too. 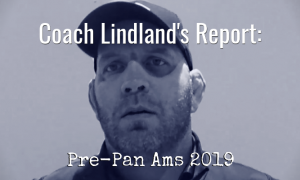 National Team head coach Matt Lindland makes it a point nearly every available opportunity to mention how the median age for medalists at the Senior Worlds and Olympic Games is becoming younger and younger. Whether or not that is going to be a continuing trend, the twist is that even if those numbers wind up climbing back up, the United States still needs earlier arrivals to the Greco-Roman program. The new era in wrestling is akin to that across all sports in general — specialization. 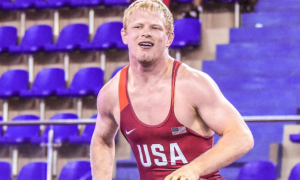 If an age-group athlete desires to become a World-level competitor in Greco, an introduction to full-time training should probably take place before the age of 22. Bey injected a full dose of enthusiasm into Greco and teammate Cevion Severado (50 kg, Xtreme RTC) coming up with an unlikely silver was also a banner moment, even if he still has some leg-grabbing ahead of him. Team USA wound up finishing a very respectable fourth after leading the team standings at the close of the first day, but there doesn’t seem to be the same cloud of disappointment you might expect. The truth is, we needed this one and we got it. The best part about that is there’s more to come. Obviously, Bey’s World Championships performance came with a whole slew of congratulatory messages on social media. Here are some highlights. That match was insane, dude. TELL ME AGAIN HOW GRECO IS BORING?! The personal, emotional, and disciplinary growth of WORLD CHAMPION @kamaltoe170 is incredible. You make us so proud. Obviously, outside of Bey, Severado is the biggest story. But enough with the “He’s not even supposed to be here!” nonsense. If Severado achieved anything on Saturday, it’s that he certainly proved he was in the right place at the right time, and he understood how to take advantage of it. Severado also beat the man who beat the man. Kensuke Shimizu (JPN) threw a whipping on reigning World Champion Vladislav Melnikov (RUS), and so conventional thinking would be that Shimizu would at least be able to handle a newcomer like this kid. Ha! Severado not only defeated Shimizu in their semifinal match, he wound up dominating him to the tune of an 8-3 score that really wasn’t as close as it sounds. And this came after Severado had turned back Maksym Vysotskyi (ISR) and Dominic Dudzinski (POL) to even get that far. Yeah, Severado was shut out by one of Iranian’s best prospects in Poya Dad Marz in the finals, but that doesn’t do anything to take away from what he did in Tampere. There have been several impressive recent first-time World performances by US guys, but Severado’s is one that is going to stand out for awhile. Returning bronze medalists Taylor LaMont (60 kg, Sunkist) and Hancock both wrestled really well on Saturday despite not finding the podium. But that wasn’t all their fault. Hancock was leading Suleyman Erbay (TUR) 3-2 in the second period of the 96 kilogram quarterfinals when he was tripped, giving up a takedown. The sequence was looked at and the officials, in their eminent brilliance, still came back awarding Erbay two. Erbay then lost in the semis, knocking Hancock out of the tournament altogether. It was a bitter pill for the US to swallow. The only silver lining to the whole thing, if you want to call it that, is Hancock can now focus entirely on washing it all away with a big performance in Paris at the Senior Worlds. Not to be outdone, LaMont was also jiffed badly, except his incident was on a non-call. Down 2-1 with time running out in the bronze medal match against Magomed Magomedov (RUS), LaMont had his singlet blatantly grabbed by the Russian wrestler just as he was in the midst of a frantic last-ditch effort to score. The leg foul on Hancock happened so fast and the bodies involved were so big that some missed it on their first view. LaMont’s was different. It was obvious. There was such little time left (:10) and Magomedov didn’t look like he was in impending trouble, but the sting is still there. A singlet grab is supposed to be called no matter what, in any style, even in Greco where it happens a little more regularly. Randon Miranda (55 kg, NYAC-OTS) figured to be in the hunt at some point yesterday despite his draw might have been the toughest of the entire squad. 2015 Cadet World Champion Turabek Tirkashev (UZB) nursed a 6-1 advantage into the second following a front headlock turn and an arm throw. To Miranda’s credit, he never stopped fighting his guts out and his resilience nearly paid off. Late in the second period and needing to score, Miranda held a high front headlock and elevated. Tirkashev tried hoisting Miranda up by holding his hips. And then in one fell swoop, Miranda dropped into a beautiful high dive, taking Tirkashev to his back and off the edge for four to cut the deficit to a mere point. Unfortunately, there wasn’t enough time left for Miranda to capitalize further and that was that. Tirkashev lost in the semis to eventual champ Kerem Kamal (TUR), who the Uzbek defeated to win his World title two years ago, and finished third on the day. Early on in his bout with Artur Vititin (120 kg, EST), Cohlton Schultz (NYAC) looked like he was going to be just fine. He had bullied Vititin down for two and immediately went to work with a front headlock before being stood back up. 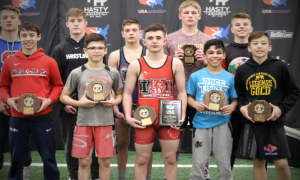 The 16-year-old was grinding his opponent, showing excellent poise and good power as he tried to control the center before Vititin landed a fortuitous arm throw for four points and proceeded to stymie Schultz throughout the remainder of the match. Although a loss for Schultz, it was good to see him stand in there and bang with an older, experienced foreign opponent the way he did. He’s going to be an absolute beast in Athens, that’s for sure. A lot was also expected of Wyatt Koelling (84 kg, MWF). Koelling, an exceptionally talented wrestler lauded for his toughness and ability to stay within himself, never really got going against Aleksandar Stjepanetic (SWE) in their qualification round match-up. Stjepanetic is a well-traveled Junior who has extensive experience and he kept a brisk pace for Koelling to try and follow. But it seemed like there were a few opportunities for Koelling to blast into, but he had trouble pulling the trigger. At 66 kilograms, Dominick Demas (CWC) also had trouble getting from first to second gear, but his opponent, Joilson de Brito Ramos (BRA) deserves some credit, too. de Brito Ramos was aggressive the entire match and sought out points wherever he could find them. 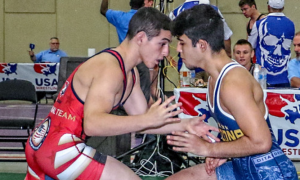 A two-time Cadet World Team member, it’s unlikely Demas was too intimidated of the environment, or discouraged after being down by a few points. de Brito Ramos poured it on in the second period and Demas was never able to recover. Hopefully, he rebounds and gears back up for Greco the first chance he gets. Team USA accumulated 29 points on Day 1 and 0 points on Day 2 — and still finished in fourth place. Not bad. Iran took the team title with 58 points, Russia was second with 53, and Turkey came in third with 38. The 2017 United States Greco-Roman World Team has now broken camp and will be making their final preparations before leaving for Montpellier, France next week. There will still be training going on at the Olympic Training Center, but it is being cut back to once per day and obviously with camp being over, it’s a much smaller group. We’re going to do a post-camp wrap-up with Robby Smith (130 kg, NYAC) this week to make sure we have all of the bases covered before the team heads overseas. The next Coach Lindland’s Report will be heavy on the Juniors, as expected. Updates on the Seniors wrapping camp. 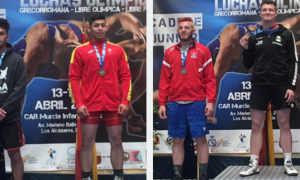 Interviews with Cadet World Team coach Zac Dominguez and WCAP stud Courtney Myers. A new podcast episode, some interesting news on our end, and an early preview of the Senior World Championships.